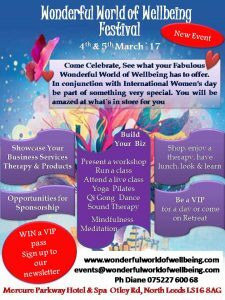 We are delighted to be attending the two-day Wonderful World of Wellbeing weekend on 4th & 5th March. Yoga Kula are also one of the main sponsors of the event. The event is a Leeds only event held at the Mercure Parkway Hotel & Spa. Angela our studio director will be teaching a Hatha class on Saturday 4th and on Sunday 5th will be giving a talk about the different styles and branches of yoga from ancient to modern as well as about her own yoga journey. We will also have a stall for any questions and queries about Yoga Kula and what is on offer at our studio. We would love to see you there! An hour long Hatha Yoga class in which you will learn simple breathing techniques, meditation techniques and some yoga poses. We want you to feel first-hand the immediate benefits of practicing yoga. The class will be open to all levels. Angela will look at which style is best for which type of person and why. We hope after this talk you will have a clearer idea of what yoga style is best for you and also understand why there are so many different types of yoga currently available. To book your ticket now click here.